SAN DIEGO, June 5, 2017 /PRNewswire/ -- In honor of military appreciation month, Bridgepoint Education and its academic institutions, Ashford University and University of the Rockies, hosted a series of events to show appreciation to military, veterans, and their military-affiliated workforce. These events included a military roadshow, a Center for Excellence in Teaching and Learning (CETL) session focused on the military, a military appreciation event, and participation in Remember Everyone Deployed (RED) shirt Friday. "Bridgepoint Education and our academic institutions are proud to recognize and celebrate the dedication and sacrifices of our nation's servicemen and servicewomen," said Bridgepoint CEO Andrew Clark. "Our celebration of military appreciation month embraced all of our military-affiliated staff and faculty, including those who have served our country, military spouses and children, and our employees who provide dedicated support to military and veteran students each and every day." On Wednesday, May 10, Ashford staff presented a military roadshow at its San Diego, Calif. and Clinton, Iowa locations. Attendees were invited to learn more about the unique services Ashford provides its military and veteran students, in addition to meeting members of Ashford's military team who service the institution's military student population. RED shirt Friday was observed on Friday, May 12. 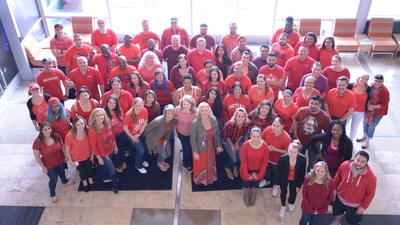 Bridgepoint, Ashford, and Rockies employees showed their support by wearing red shirts to remind others of our military servicemen and servicewomen who are currently deployed overseas. On Tuesday, May 23, Ashford's student veteran access and wellness counselor, Ashley Kirwan, presented a military-focused CETL session on post-traumatic stress, traumatic brain injury, and military suicide. During the presentation, Kirwan shared relevant information to help identify and understand the challenges military service members can experience, and the research that exists on the presented topics. The month-long celebration wrapped up with a military appreciation open house held Tuesday, May 30, at Ashford's Clinton, San Diego, and Denver, Colo. locations. The event, hosted by Ashford's military and veterans taskforce team, provided additional insight into Ashford's commitment to the military and highlighted the institution's 2017-2018 Plan of Action that will help support its military-affiliated employees. Where heritage meets innovation – that's Ashford University. At Ashford, students discover relevant degree programs, innovative technology, and cherished tradition. Ashford offers associates, bachelor's, and master's degree programs online, allowing students to balance life by providing the flexibility to do school work anywhere, anytime. For more information, please visit www.ashford.edu, www.facebook.com/ashforduniversity, www.twitter.com/AshfordU, or call Marianne Perez, Media Relations Manager, at 858.513.9240 x11636. University of the Rockies is a leading graduate school of the social and behavioral sciences that offers programs for students seeking their PhD, PsyD, or Master of Arts degree. Based in Denver, Colo., the University provides students with the convenience of an online education. While working toward a degree from anywhere in the country, students enjoy access to industry professionals, research, and publishing opportunities. For more information, please visit www.rockies.edu/, www.twitter.com/URockies, www.facebook.com/UniversityoftheRockies, or call Marianne Perez, Media Relations Manager, at 866.621.0124 x11636.